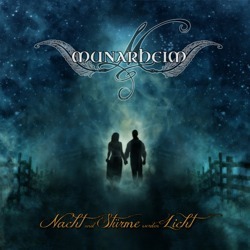 German symphonic folk black metal band Munarheim has revealed all details of its upcoming debut album “Nacht und Stürme Werden Licht”. Formed in 2007, so far they have released one demo and 2 EPs, “…und der Wind Sang” in 2009 and “Liberté” in 2013. The band split up in 2010, but thankfully they reunited in 2011. Their first full-length album will be self-released on 22nd of February 2014. “Nacht und Stürme Werden Licht” will be available in a standard digipak edition with 12-page-booklet, as well as in a A5 hardcover book edition with 48 colored pages including CD & Bluray limited to 333 hand-numbered copies! Both editions are available for pre-order at band’s online shop. Munarheim have unveiled the beautiful cover artwork, the album tracklist and a video for “The Last Unicorn” that you can watch below. Few weeks ago they released the official video for the song “Terra Enigma”. Both these songs are from the upcoming album.